If you're anything like us, our summer meals revolve around the grill. Grilled chicken, grilled hot dogs, grilled squash and potatoes and corn! 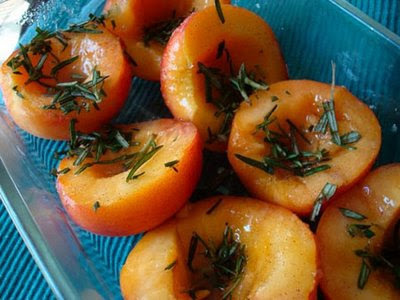 One of the latest recipes we've tried on the grill were Grilled Peaches with Cinnamon and Rosemary! I love it, my hubby, not so much - I think the rosemary overwhelmed his taste buds, but anywho it is a must-try summer recipe! Preheat the broiler if you plan to use it instead of the grill. Rinse the peaches, pat dry, cut in half and remove the pits. Place the peach halves in a baking dish. Mix the sugar and cinnamon, stir in the oil and brush the mixture over the peaches. Sprinkle with rosemary. Marinate for 10 minutes, turning over and basting once. Broil or grill the marinated peaches for 2-3 minutes on each side, until they are tender but not soft. Serve immediately, alone or with a scoop of vanilla or cinnamon ice cream. The peaches look delicious! I've read French Women...--but I didn't know there was a website too! I'll have to check it out. They were really good! I didn't try ice cream with them but I bet that would make it even better! You can sign up for an account with the French Women website and save your favorite recipes, etc! Kinda cool! This sounds so delicious. I never thought to grill peaches. Yum! YUM. thanks for sharing. love grilled peaches.